Has Laundry Bin a Problem? Few students come to college totally prepared. When you’ve just moved out, chores and responsibilities become intimidating, monstrous piles on the floor, quite literally. A new adult who’s not careful can easily become overwhelmed and unsorted. One of the most effective ways to manage an issue is to divide it into smaller problems. For laundry, this is called sorting. You don’t have to do it all at once, and the responsible adult can do several small loads a week. Clothing and linens should be sorted by fabric type, color and weight. Dark colors or new clothes with fresh, heavy dye should be separated from lighter colors and whites. Remember “wash-before-wearing” designer jeans? Same principle. Dyes can bleed if you’re not careful, so separate your Calvin jeans from your Calvin briefs. Heavy items, like blankets, sweaters and especially towels should be separated from your lighter garments, as their weight is likely to wrinkle or damage smaller items when washed together. Sorting by fabric can be tricky, but you should always separate out wool and silk. They both react poorly to heat and will shrink in the dryer. Wash cold. Cotton is the standard option and can shrink mildly but not as severe as wool or silk. However, heat does degrade the fiber over time, making it less soft and age faster. Synthetic fabrics (like polyester, nylon, acrylic and spandex/elastane) degrade severely in heat and should be washed as delicates (cold). Remember—when in doubt, wash cold and don’t toss these in the dryer either; the high heat weakens the material. So the next time you do a load of sports bras, leggings or even swimsuits, hang them up to dry instead. Lulu will thank you herself. Are you sensing a trend? In general, cold water prevents color bleeding and should be used to maintain the softness and integrity of a garment. Hot water removes stains and dirt more effectively but at the cost of the longevity. It’s good once every week or two to do a load of only whites, using hot water and bleach to really make those whites shine. 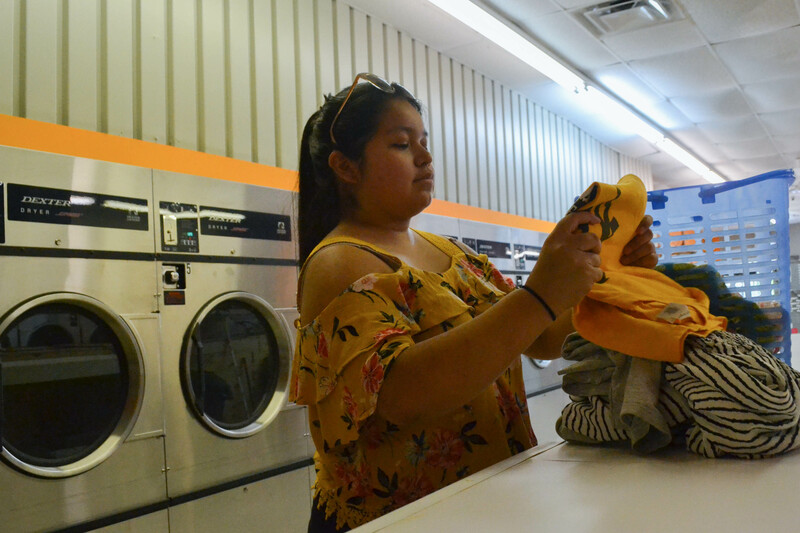 Meg Schurmann is a Georgia State senior and she uses her time sorting to make sure the clothes are ready to be washed. That means checking pockets, zippers and buttons and bras so they don’t damage in the wash.
Where you put your laundry can be important, too. The laundry hamper becomes a decor item much like a rug or lamp and informs your guests to the care (or lack thereof) you take in your surroundings. The best hamper is one with a removable, washable inner bag. Throw that in the wash once a week to avoid an offensive room smell and earn extra points if it has wheels, especially in the dorms where the washer and dryer are several floors away. If you live in a dorm or an apartment with communal laundry, it can cause a lot of stress or cause you to avoid it as much as you can. So how often do our clothes need to be washed? Knowing what we know, how best do we balance our time, energy and water consumption? It depends! Let’s start with an easy one: athletic clothes. Athletic clothes should be washed after every wear. The same goes for T-shirts, socks and other undergarments. Bras are slightly different, and can be washed every two to three wears. It’s best to store them with the hooks fastened to prevent them snagging other delicates in the drawer and look into using garment bags for even more gentle washing. Sweaters benefit if washed sparingly, every three to four wears, barring a serious stain. Jeans should follow the same schedule as sweaters. There’s a myth floating around that jeans don’t need washing. Do not be fooled. Clothes that go without washing warp, deform and lose their fit over time, and you don’t want every pair you own to look like mom jeans. You probably need to wash your bed sheets and pillow cases more often than you are right now—about every week or two. This is an easy one to forget, so make a note. Those who struggle with body or face acne might want to wash their sheets or pillow cases more frequently, as this will discourage acne (doing chores can be self care, too). Duvet covers and pillowcases are a once a month thing but you might want to launder them more often if you have pets. We’re mature enough to know that ‘lifehack’ journalism is just the old wives’ tales of the internet age, but old wives know what they’re talking about. If you’re facing permanent pit stains, first of all it’s more likely to be buildup from your antiperspirant than sweat. Secondly, to remove the yellow marks, soak the area in lemon juice. After it has soaked, scrub the area with baking soda, rinse and wash normally. Most food stains result from oil and the key here is not to panic. Washing, rubbing and scrubbing the stain are all a recipe to set the stain into the fabric. Instead, apply baby powder or cornstarch over the oil stain until it is covered. The powder will absorb the oil, lifting it from the fabric. Dust it off and wash normally. Many clothes have precious real estate on the front. Got a sick graphic or a cool patch? Turn it inside out. This prevents wear on the parts that matter and is a great way to prevent fading on all your clothes, from T-shirts to jeans. If you let your clothes sit in the dryer and the wrinkles set into the fabric, don’t worry. Set the dryer for a hot spin after putting one or two ice cubes in with the clothes, and the steam they create will loosen any wrinkles and leave you to fold and hang your clothes in peace. It happens sometimes that you need a shirt clean now. Maybe you meant to do laundry last night and you’ve got a job interview in an hour. Maybe you need your lucky shirt to go on a first date. In these dire times, save time by putting a towel in the dryer with your emergency clothes. The Georgia State dorms have famously hard water, which is a pain for many new residents to get used to. You can restore some of the smoothness and shine to your clothes by adding liquid fabric softener to your routine if you hadn’t already. Don’t use fabric softener on towels or athletic clothes, as the conditioner coating these fabrics will cause them to perform poorly for their moisture-wicking tasks. With these tips, you can walk through the communal dorm laundry room lording your skills over your less well-read peers. Or don’t do that. Yeah, don’t do that. Good article tackling needed information! Thanks.